Osteoarthritis is a common joint condition in dogs, cats and horses and is characterised by wearing of the joints, which may cause movement problems such as pain. It is brought on by a specific cause in the joint, and then it becomes self-sustaining and the wear worsens. Products that can help when your pet is suffering from osteoarthritis are, for example, CBD treats or CBD oil. CBD is the abbreviation for cannabidiol. This substance could help against stress and fear, inflammations and pain. What does a joint look like? A joint consists of two (or more) bones that fit together. The ends of the bones are covered in cartilage. These bones are held together by a joint capsule. The cartilage is elastic and provides a lovely, smooth surface for the extremities of the bones and protection of the underlying bone. Thanks to the smooth surface, the bones move against each other easily and the elasticity absorbs any shocks. The inside of the joint capsule is covered with a membrane, the so-called synovial membrane. This produces the synovial fluid, which lubricates the joint and contains nutrients for the cartilage. What joint changes occur in animals with osteoarthritis? When osteoarthritis occurs, the cartilage becomes rougher and thinner, meaning the bones can no longer move smoothly against each other. The elasticity, including the ability to absorb shocks, is reduced by this. Because the elasticity is reduced, the capsule surrounding it has to absorb more shocks and is damaged, which causes inflammation. The damaged capsule starts to thicken, making it stiff and rigid. As a result of this inflammation, the synovial fluid is thinned down and contains little to no building materials, which are required for the build-up and recovery of the cartilage. As a result of the reduction of cartilage, the pressure on the joint surfaces is not distributed as effectively. The bone expands its bearing surface by thickening and broadening. Bone growths are formed at the end of bones. In contrast to cartilage, bone is sensitive and can cause pain stimuli when put under pressure. In the initial phase, the dog will struggle to get up out of its bed, or might have trouble walking as a result of the pain caused by osteoarthritis. These dogs usually suffer from lameness when they get up. This refers to stiff or rigid walking at the start of a walk or when your dog gets up from its bed, which reduces as the dog gets going. A good option to opt for in this stage is to go for an orthopaedic dog bed. These beds can help provide additional support and comfort in your dog's joints. In a more advanced stage, the dog will suffer from weakness of the muscles as well as increased pain levels. Because the joints are under less strain, the muscle mass around these joints will also reduce and the animal will start to show weakness of the muscles. Together, these symptoms result in the dog having a lot of difficulty getting up and sometimes it will even need help, be unable to jump into the car and have a tendency to slip on slippery surfaces. Walking becomes increasingly difficult. As the osteoarthritis advances, your dog will not want to go out, might stop in the middle of a walk or might lie down. Damage to the cartilage may occur due to excessive strain on one or several joints, injuries or a long-term deficiency of essential (food-derived) amino acids. What's more, hereditary factors may play a role. There are a number of ways to reduce the risk of osteoarthritis. A healthy nutrition is important to ensure that your dog gets the necessary vitamins, minerals, trace elements and amino acids. The dog food that you can buy these days will generally contain plenty of these ingredients, but sometimes additional supplements are required to maintain the dog's healthy condition. When you start looking at large breed puppies, make sure you consciously look for a litter whose parents have been tested for common joint conditions such as hip dysplasia (HD) or elbow dysplasia (ED). If both parent animals are free from these conditions, then the risk of your puppy ever having HD or ED. Please take care with the exercise regime of growing puppies and older dogs. By ensuring that young dogs do not exercise excessively or with too much intensity, you are also making sure that the joints and bones develop properly. A growing dog is not ready to cope with peak strain on the muscles such as fast running and rough play, running after a stick or ball, running alongside a bicycle, running up and down stairs and jumping into and out of the car. Generally the rule is that the puppy can walk for as many minutes as its age in weeks. Older dogs often also benefit from short walks. We will discuss exercise regimes below. Osteoarthritis cannot be cured, but if you treat your pet well and support its health, the process can be slowed down. Weight reduction for overweight animals. An animal's body weight puts a lot of pressure on the joints. By ensuring that the dog is in optimal condition and maintaining this, you can prevent the joints from wearing down prematurely due to excessive strain caused by an overweight pet. It is important that you maintain a regular exercise pattern. Go for multiple short walks a day instead of one long walk. In addition, it is a good idea to have your pet walk in straight lines where possible, such as running alongside your bicycle. Swimming is also a form of exercise in which the joints are under minimal strain. Peak strain and excessive strain should be prevented. Taking your pet to the beach for a weekend is not a great idea, for example. Quick turns and twists are highly detrimental to joints of pets with osteoarthritis. Pet physiotherapists can help you prepare a movement plan for your dog. There are special diet foods available that support your pet's joints. These diets often contain Omega 3 fatty acids that ensure that fewer inflammatory products are created in the joint. What's more, they often also contain chondroitin and glucosamine or green-lipped mussels, which support the joints. Examples of these foods include Specific Joint Support, Royal Canin Mobility CP2+, Hill’s Canine J/D. In addition, you can also supplement your pet's regular food with a food supplement with these supportive ingredients, such as Trovet Mobility, Sashas Blend, Arthruloxyl, Seraquin, Doils Joint. Pain killers and anti-inflammatory drugs such as non-steroid anti-inflammatory drugs, steroid anti-inflammatory drugs and sometimes opiates. Your own veterinarian can advise you on this. Regular, controlled movements are best for your pet. 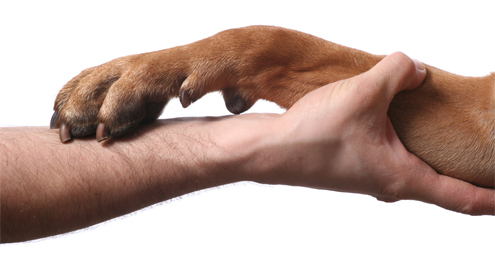 A pet physiotherapist can help you to optimise your dog's training. Some physiotherapists also offer hydrotherapy. Recognising osteoarthritis in cats is much more difficult than in dogs. They display fewer specific symptoms than dogs, as they will not show lameness as quickly. Symptoms in cats are more likely to include sleeping more, not jumping onto the window sill or kitchen counter anymore, being grumpier, not grooming themselves as much, playing less or missing the litter tray when they urinate, for example. These are symptoms that can also be confused for "normal" symptoms of ageing, as 30-90% of cats over the age of 6 suffers from osteoarthritis. Osteoarthritis cannot be cured, but if you treat your pet well and support its health, the process can be slowed down. Treatment for cats with osteoarthritis is largely the same as for dogs. In the event that your cat is overweight, weight loss is recommended. This is more difficult to achieve for cat owners than it is for dog owners, because the biggest change they can really make is adapt the cat's home environment. Cats like to climb and see their surroundings from up high. Try to offer your cat steps or stairs so that they can get higher up without jumping too much. Instead of a vertical scratching post, offer your cat a horizontal one. Try to keep your cat moving by placing food bowls in various places or by stimulating your cat to play. As cats often struggle to clean themselves, you can help your cat by brushing it (if the cat allows this). There are also special foods on the market for cats, such as Specific Joint Support, Royal Canin Mobility, Hill’s J/D. We also have a number of food supplements for cats, such as Trovet Mobility, Sashas Blend, Seraquin, Synopet. Regular, controlled movements are best for your pet. A pet physiotherapist can help you to optimise your dog's training. Osteoarthritis in horses is often detected in the neck, legs or jaw joints. Symptoms that may be observed include difficulty eating, not wanting to bend their neck, lameness and irregular walking. Osteoarthritis may be caused by excessive strain, deviating leg positions, joint infection or ageing. Your veterinarian can diagnose osteoarthritis by taking an x-ray. In the event that your horse is overweight, weight loss is recommended. It is important that you maintain a regular exercise pattern. Your horse should stay mobile, but you should also avoid excessive strain. Ensure that the horse gets some movement on a daily basis and give it a good warm up and cool down. Avoid peak strain such as too much jumping, cross competitions, etc. Consult your veterinarian to create an appropriate exercise regime. We also have a number of food supplements for horses, such as Primeval Gelatinate, Puur glucosamine extra, Supple-Eze Equine. Painkillers and anti-inflammatory drugs such as non-steroid anti-inflammatory drugs, steroid anti-inflammatory drugs and sometimes opiates. Your own veterinarian can advise you on this. Regular, controlled movements are best for your pet. A pet physiotherapist can help you to optimise your horse's training. For healthy and flexible joints in dogs. Tasty snacks with cannabidiol . Delicious paste that contributes to the wellbeing of your dog or cat. Tasty chews for healthy joints (contains UC-II collagen). Supports regeneration of the muscles in dogs & cats. Helps strengthen joints, cartilage, ligaments & tendons.